Course Description: Students will be reading through the book of Mark and the New Testament books from Acts to Jude. Students will learn and apply scriptures as well as explore the geography of the New Testament. Note to parents: the Ls are reading NIrV and the Ms are reading NIV. I don’t use the NIV, but I chose these as the most accessible for them. If you want your child to read another version, just click on the link provided and have your child choose your version from the menu at the top of the page. If you want to learn more about my Bible background and beliefs, go here. Do you think they fixed it afterwards? Of course, this means Jesus came to save everyone because we were all born human, meaning we are all sinners until Jesus saves us. The Pharisees didn’t see themselves as sinners, though Jesus considers them some of the biggest sinners. Who are the 12 disciples? Name them. Say as many as you can. Look up the rest until you name all twelve. This story is called the parable of the sower. A parable is a story that teaches. It makes a picture of the lesson. A farmer is planting seeds. Some of the seeds grow. Some of the seeds get eaten. Some withered. Some were choked by thorns. One, I think He was probably exhausted. Two, He wasn’t worried at all. They asked Love if He cared. They didn’t get who He was, did they? Do you ever accuse God of not caring? That’s something to remember the next time there is a super storm. This is how God’s economy works. They had a little. They gave it all. They ended up with more than they started with! He didn’t understand that Jesus’ death was from God. When Jesus says that Elijah came first, He was referring to John the Baptist. Jesus doesn’t pray to get rid of the demon. It must mean that He had been prepared for the work by His time in prayer. Girls, if you are ever tempted to dress in a way that would attract a boy’s attention to your body, remember verse 42! Tell someone about the triumphal entry and Jesus clearing the temple. Tell someone the stories in the chapter. The disciples and Jesus were eating the Passover meal. Do you remember that the Israelites ate lamb the evening before the Passover? That night death passed over them because of the blood of the lamb on their doorpost. Tomorrow, on Passover, Jesus will be the Lamb that is sacrificed. By His blood shed for us, death passes over us. Below is a tomb that maybe was similar. 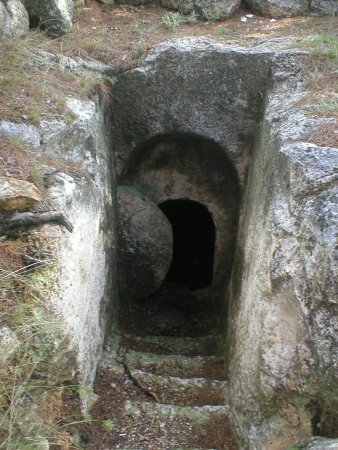 It is cut right out of the rock and has that big stone that rolls in front of the door. That stone is big enough to cover a door that is big enough to walk through. I took this picture. It was a tomb used by Hittites. In Psalms we read about them mocking Jesus, casting lots for His clothes and His calling out to His Father before He died. Everything happened just as God knew it would. You read that part of the chapter isn’t in some manuscripts, but I find it interesting that every version always includes it. If they don’t think it belongs, then I would think it would be left out in some versions. The believers gathered to together to pray. The apostles were doing all of the miracles that Jesus had done. Everyone was healed. In the first part of the chapter they choose men to help organize the giving of food to widows. Stephen was one of the men chosen. Never buy an “anointing.” People sell oils and other things that are supposedly an “anointing of joy” or healing or whatever. It’s just like Simon wanting the “anointing to lay hands on people for them to receive the Holy Spirit.” The only “anointing” is the Holy Spirit. All gifts come by the Holy Spirit in you. The Holy Spirit is free. Anyone selling the “anointing” is a scam artist. God gives all His good gifts freely. You can see Joppa and Lydda on this map of Israel. Cornelius was not a Jew. You need to realize that those who have been believing and repenting have been Jews. Jews could become “unclean” by having a non-Jew in their house or by eating with them. Peter is being bold in following the Lord to be with these men and to have them in his house. Peter’s vision is about clean and unclean animals. Peter has always followed the Jewish laws. Jesus changed the meaning of clean and unclean. It was no longer based on ritual acts, but it is based on one’s heart. God wasn’t unloving or unfair in letting James die. It was God’s choice for him at that time. James no doubt had surrendered his body to the Lord’s service, however that might look. Peter is later killed; it wasn’t time yet. Their enemies had no control over the time they were appointed to die. God was in control of it. What message does Paul preach in Antioch? Paul and Barnabas fought back the people and assured them they were just men and gave glory to God. Paul and Silas were accused of making trouble all over the world. The “world” to them was smaller than it is to us. It is still a great compliment to a Christian. We should be turning the world upside down. What story does Paul tell? No one else had the chance to share the gospel with such rulers. God made a way for Paul to. It may seem like things aren’t going the right way for Paul, being attacked and arrested, but it was God’s way to bring the gospel to the leaders of Rome. That would be the wrong reaction though. God had this all arranged. Paul was arrested so that the leaders of Rome would have the chance to hear the gospel. No one else could bring it to them. This was God’s way. As things seem to go all wrong in the rest of the book, keep in mind that God’s in control and is using each event for his purposes. Paul and some other prisoners were put on a ship to head for Italy, where Rome is. Partway through their journey, Paul knew that they shouldn’t continue because it would be dangerous, but the Roman centurions didn’t listen. View the map of Paul’s journey to Rome. Find a place mentioned in your reading today and find it on the map and on the list. If you click on the G by it, then you can see where it is on a modern-day map. Read Acts 28. This is the last chapter of the book of Acts. The rest of what you will be reading this year are letters. Letters written to Christians. We are starting a new book, Romans. It was a letter Paul wrote to the Christians living in Rome. He wrote it around 57 AD. This chapter says that no one can say they didn’t know God existed. It says that everyone can see that a powerful God exists in what He has created. What magnificent things in the world do you think show that there is a powerful God who made them? When was a time you felt your conscience tell you that something was wrong? Use this version to try and figure out what atonement, redemption and justify mean (verses 24-26). Here are the dictionary definitions: atonement, redemption, justify. How do these words relate to you and Jesus? When it talks about “work,” it means trying to earn God’s approval by doing good things. There are people who think that if they do more good things than bad things, then God will let them into heaven. But God is perfect, holy. He can’t be with sin. We can’t be with Him unless we are perfect too. We can only be perfect, and right with God, by having our sins forgiven and having His Spirit live in us to help us do the things God has chosen for us. Paul points out that Abraham was considered righteous before he was circumcised. Circumcision was a mark of the Jews. It set them apart as God’s people. Paul is saying that God’s righteousness is for all who believe, not just for the Jews. What does verse 25 mean? Verses 1 and 2 say that through Jesus we get access to God’s grace. What is God’s grace? It is everything He gives us, all free and undeserved on our part. Do you remember what justify means? You can go back to day 62 to look again if you don’t remember. The word reconcile means to restore a friendship. What do you think reconcile means in verses 10 and 11? Who are we reconciled with? How? Why were we “enemies” of God? Draw a picture, diagram, comic strip, or something to show all four parts of verse 22. Do you remember Romans 3:23? These verses say that God is God and He can do whatever He decides to do. Read Romans 9:30-33, and 10:1-4. Read Romans 10:9-17. Fill in the blanks below. Do you have any idea in what ways God has gifted you to prepare you to serve the body of Christ? Ask God to help you with what you find hard. Ask God to help you be loving in every way described. Read Romans 12:9-21, yes, again. What do you think the last verse means? How does that law encompass all of the others? These verses talk about how we should think about others and how we should treat them. This book is a letter written to the Christians who were part of the Church in the city of Corinth, Greece. Read 1 Corinthians 3:3 and 3:16-17. Scroll down to read the second. Does verse 11 surprise you? Do you realize that Jesus and Paul were both homeless at times? What are ways that you could honor God with your body? What are ways of using your body that would dishonor God? These verses say that Israel is an example to us. They sinned and were killed. Sin kills us spiritually. We need to remember Israel and remember how dangerous sin is. The rest of the chapter is about food sacrificed to idols. This is still important to believers in some parts of the world. The main point is found in verse 24. What is it? How can you apply that verse? Good memory verse: 1 Corinthians 10:13. Read 1 Corinthians 12: 27-31 and chapter 13. What does verse 14 say? How can you be more loving today? How can you obey verses 13 and 14? Read 2 Corinthians 1:1-11. This is Paul’s second letter to the Christians living in Corinth, Greece. Jesus tells us that we will have troubles. But the Scriptures also tell us that He will save us out of our troubles. Read 2 Corinthians 1. This is Paul’s second letter to the Christians living in Corinth, Greece. This is comparing the Old Testament and the New Testament. The law “sentenced people to death” because they couldn’t obey the whole law. Jesus came to show us that it is by faith we can be saved. Verse 7, “the ministry that brought death,” is the law of the Old Testament. If you are a Christian, how have you become like Jesus? How are you still not like Jesus? Paul says that he has renounced “secret and shameful ways.” Do you have any secret sins that you need to confess? Did Paul have an easy life? Why or why not? Jars of Clay This is a song on youtube. Make sure you have permission to go there. If you haven’t ever, go to the bottom of any youtube page and choose “on” for SafeMode. The music group is called Jars of Clay. They got the name from this Bible chapter. Think about a trouble that you or your family is facing. How can following Paul’s example help? Jars of Clay This is a song on youtube. Make sure you have permission to go there.If you haven’t ever, go to the bottom of any youtube page and choose “on” for SafeMode. The music group is called Jars of Clay. They got the name from this Bible chapter. These are good verses to memorize or at least internalize what they are teaching. How can we “come out” and “be separate?” There are some Christians that live completely apart from the world in communes. But I don’t think that’s what God means since He sent His disciples to go to the people where they are (Acts 1:8). What do you think it could mean for you to be separate from unbelievers? What do you think are some things that “pollute” your body and mind and spirit that you should stay away from? Paul struggled with fear. (verse 5) It’s normal to have fears. But when we feel afraid, we can turn to God to comfort us, like He comforted Paul. It’s not okay to let fear control you. Fear doesn’t get to decide what you do. Paul didn’t run away from serving God because he was afraid. He continued doing what he knew was right and God comforted him. You can say no to your fearful thoughts and tell them that you know God is with you and loves you and is taking care of you so you have nothing to be afraid of. We should never act like sin is okay. Sin is bad. It is rebellion against God. What do you think are some things that “contaminate” your body and mind and spirit that you should stay away from? We should never act like sin is okay. Sin is bad. It is rebellion against God. It can be hard to stand up against sin, but you could help others repent by showing them that you don’t think their sin is okay. When we show people their sin is wrong, we need to make sure of two things. One, we are doing it because we love God and we love them and want to see them right with God. Two, we aren’t being hypocritical and living in sin ourselves. This passage is about giving. Read 2 Corinthians 10:1-6 and 12:7-10. Think of an example of a wrong thought that you sometimes have and explain how you can take that thought under your control and change your thinking to make it obey Christ. Think of an example of a wrong thought that you sometimes have and explain how you can take that thought captive and change your thinking to make it obey Christ. Find Galatia. Keep this map open. Where would it be on this map? If you can’t figure it out, use the map below to help you. Where would Galatia be on this map? What’s the difference between believing in Jesus and having faith in Jesus? It depends on how you look at it. Like I said, the devil believes that Jesus exists and is the son of God. He knows that he died on the cross and rose from the grave. But we can have faith in Jesus to save us from our sins. We can have faith that He shed his blood to save us from our sin. We can have faith that He gives us His Spirit and makes it so that we can be with God. Here’s another verse to memorize. There are 613 commandments in the Old Testament law. There are many rituals that they had to perform in order to be right with God and no one could follow all of the laws perfectly. That’s why it says that they were cursed by the law. We are not saved by following the Old Testament law. We are saved by faith in Jesus. There are many rituals that they had to perform in order to be right with God and no one could follow all of the laws perfectly. That’s why it says that they were cursed by the law. We are not saved by following the Old Testament law. We are saved by faith in Jesus. Read Galatians 3:26-29, Galatians 4:1-7. You know how I remember that list of “fruits of the Spirit?” There are 3 with one syllable, 3 with two syllables and 3 with 3 syllables. What is a good thing you can do today for someone else? Ephesus is also in Turkey. Go to this page and find Ephesus in Turkey and look at the pictures of ruins that are still standing from biblical times. Read Ephesians 3:14-21. Yes, again, but in a different version. Here’s a song, How Great Is Your Love 🙂 Get permission to go to the video; it’s on youtube. Paul prays that believers would know how immense is God’s love for those who believe? Do you know how much God loves you? Do you ever question if God loves you? Pray this prayer along with Paul that you can understand how great God’s love for you is. This chapter lists several things you shouldn’t do. Do you do any of those? Do you need to confess anything? Do you need to repent of anything? These verses are talking about husbands and wives. Women can be bosses; they don’t have to submit to all men, just their husbands. What do you think might be an example of an “evil” day? Philippi is in Greece. Here is a map of part of Greece. Notice the three pennisulas, the three “fingers” that reach down into the Aegean Sea. They are an easy way to spot Greece on a map. Now look at these maps and find Greece and where Philippi would be. If you don’t know what country that is, look here. When is it hard for you to not worry? What are examples of the kinds of things should you and shouldn’t you think about according to verse 8? Find the country on these maps. What part of Paul’s prayer in verses 9-11 would you like to pray for yourself? Here’s a picture of Colossians 2:14. Read Colossians 2. A “sensual indulgence” is giving yourself whatever feels good. Whenever you hear a new teaching or a fantastical testimony, make sure you compare it with what the Bible shows us to see if it is really from God. I do believe in angels and people seeing angels. There are people who tell crazy stories that usually build up themselves. I’ll tell you one of our angel stories. My daughter was two when we first went overseas to work with the Roma, better known as the Gypsies. Our first year we didn’t live in their village, Shutka, and took the bus to go visit. One day my daughter said, “Why do those two men always get on the bus to come to Shutka with us?” There was no one else at the bus stop. Verse 12 says to be merciful, kind, gentle and patient. What are some things you can do today to show any of those qualities? If someone said, “I come in the name of the Queen of England.” What would that mean? It would mean that the person was a representative of the queen. Verse 17 says that whatever you do, you should do it in the name of Jesus, as His representative. What does that mean? This chapter repeats a lot of themes that we’ve already seen. Name at least five. Paul mentions his “chains.” He is still in prison. One way God used his arrest was to give him the time to write these letters which are still being used by God today. Verses 5 and 6 speak of making the best of opportunities to speak with grace in answering non-Christians. What would you say to someone who was trying to get you to do something you know is wrong. Remember, make the most of the opportunity. Don’t just say no. Tell them why. Share the gospel. Tell someone which one you chose and practice doing that one thing today. Ask that person to check and make sure you are doing it. The “day of the Lord” is when God’s wrath will be poured out on the earth. We are saved from the wrath of God by the blood of Jesus, our faith in Him and the power of the Holy Spirit to give us life in Christ. Tell someone which one you chose and practice doing that one thing today. Ask that person to check and make sure you are doing it. It’s called holding you accountable. Remember, someone can sound knowledgeable and impressive, but if what they say isn’t what’s taught in the Bible, then they are just puffing smoke to mask their false doctrines. That doesn’t mean God wants us to sin more so that He can save us more. We sinned plenty before we came to know him. The end of the chapter talks about two people who had come to faith but then returned to sinful ways. It’s not okay. Paul wants to see them taught a lesson. Explain what this chapter teaches about. The first sentence of verse 10 is a very famous saying. What kind of evil can you think of that would have its root in money? Verses 4 through 6 are talking about Christians. What do you think they are saying? I want you to remember verse 13. God is God and always will be. His character never changes. He will always be faithful. Song…Great Is Thy Faithfulness. Make sure you have permission. This is on youtube. Verse 4 is what Jim Elliot wrote to Elizabeth in her yearbook (before they were married). He stayed away from girls to serve the Lord, but He eventually brought them together. One of the descriptions is that they are disobedient to their parents. If there are kids who you know are disobeying their parents and encouraging you to join them, stay away. The Bible is giving you wisdom to avoid the pit they are headed toward. Paul knows that he is going to die soon. What things does he say about it in verses 6-8? Who is someone you can “cheer up with words of hope?” Do it! When Paul calls him, “my true son in the faith,” it doesn’t mean he is really his son. It means that Paul is the one who has taught him about Christ. “Then those who oppose you will be ashamed. That’s because they will have nothing bad to say about us.” Do you live so that others will have nothing bad to say about you? That doesn’t mean doing what other people want you to do. They may disagree with you on things, but they can see that you always try to do the right thing. Do you long for what is good, to be good, to do good? Jesus talks about hungering and thirsting for righteousness. It’s the same idea. People are watching you. People who see you regularly, even if they have never spoken to you, are forming opinions about you. When I was in college, I found out that I had a reputation as the one who smiles all of the time. I had someone come to me and ask about joining the Bible study group on campus. I asked her how she knew to ask me. She said she asked around and heard that the girl who smiles all the time was in charge of it. She knew who they were talking about. Are you the joyful one? the one who complains? the one who fights? the one who helps? the one who shares? the one who is greedy? the one who is selfish? the one who is kind? What is your reputation? Read the whole book of Philemon. Read Hebrews 3:7-19. This is written to the Israelites. Do you remember how they didn’t trust God to deliver them from the Philistines? Instead of taking the land God promised them, they were forced to wander in the desert and die there. We can “enter into rest” by believing in God’s salavation through faith. We don’t have to work (the opposite of rest) to get saved. He saves us by faith so that He gets the praise not us, and then He fills us with the power to become more and more like Jesus. Read Hebrews 3. This is written to the Israelites. Do you remember how they didn’t trust God to deliver them from the Philistines? Instead of taking the land God promised them, they were forced to wander in the desert and die there. Are you a baby or have you grown up to eat “solid food?” If you are not a baby, then you know good from evil. Do you know what the Bible teaches about what is right and wrong? Do you think you understand the six “elementary teachings?” What are they? Can you explain what the Bible teaches about each one? Read Hebrews 8:6-13. This about the Old Testament vs. the New Testament. Read Hebrews 8. This about the Old Testament vs. the New Testament. When we become Christians, we don’t instantly become perfect people. 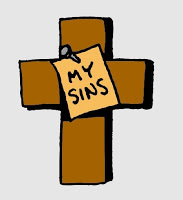 We are forgiven our past sins and made clean and holy. We receive the righteousness of Christ. Then we “work out” our salvation and reach to “take hold” of what we already have. We get transformed, day by day, into the image of Christ if we follow Him. Read your Bible and determine that you are going to obey everything Christ commands. Then ask Him to help you do it. Do you think you would respond joyfully if your home and everything you owned was taken from you because you were a Christian? What hero of faith from Hebrews 11 do you admire the most and why? What does verse 19 teach? Are you good at that or is that one you need to remember and put into practice? When do your words get you into trouble? What is another lesson in this chapter? I’m going to send you to another page to read this story about rejoicing in suffering. It’s part of a devotional. The younger kids didn’t read this story. If you have younger siblings, tell them the pastor’s story. What do you think is the most important lesson from this chapter? Which qualities from verses 5, 6 and 7 do you think you have? Which do you think are your strongest qualities? Which do you think are your weakest qualities? Ask God to help you improve in those areas and become more like Jesus. 1 John 1:9 is a good verse to memorize. Read it here. Memorize it here. Here’s a song based on 1 John, “In the Light.” It’s by a group called DC Talk. This is on youtube. Get permission to go there. 1 John 1:9 is a good verse to memorize. Below are your other verses to review. What way can you think of to love someone by action? Choose something you can do and then do it. What is one lesson from this passage? What is one lesson from this chapter? This is the last book of the Bible before Revelation. Take the time now to pray, thanking and praising God using the last two verses. What’s one lesson you take from this? Do you remember Cain, Balaam and Korah? Cain was proud and angry. Balaam was greedy. Korah was proud and presumptuous and didn’t respect God’s holiness.